Join the discussion on our forums! Come discuss Spectral Cutlass over in our dedicated Spectral Cutlass discussion topic. So sharp it can cut through a spectral tomato! Absolutely broken with Academic Espionage and Valeera the Hollow in Wild. Better tech in those Oozes. If you want to punish Big Priest in Wild, this is your pick. They have a very slim chance of success, even with Turn 4 Barnes. This card helps thief rogue more than Tess Greymane. I'm not sure why people are saying this is bad. This weapon can easily win any game if you opponent can't remove weapons. Even if they can, you get two of them. The weapon is easily buffed to high levels and there are plenty of cards from Witchwood and Boomsday to steal cards with. This weapon is really only worth playing if you do plan to build the deck around it, but its a solid deck. The worst thing really is that Cavern Shinyfinder is rotating. This is what I run in my deck...... Turn 1 Prep + Raiding party and I draw Cutlass, Cap'n Greenskin, and Cutthroat Buccaneer..... grab your steal cards and start pumpin' that mofo. You can even wait til turn 4 and Prep Raiding party and equip Cutlass...it is really good. Considering I've had Cutlass up to a 32/10 wep, you're right. It's the Reno Jackson blade. some people get their weapon to like 22 damage, how is that possible with just deadly poison? I've had mine up over 30, and it's simple, Valeera the Hallow means you can deadly poison 4 times, Captain greenskin then shuffle 3 (or six in with Spirit of the Shark) with Lab Recruiter. Valeera means you can play 2 Greenskins every turn. Carried me to beat Captain Shivers, after I gave it 16 attack (His Kingsbane had only 14). Quote from Rashktah >> "
I find it interesting that cards gained by The Lich King count towards the 'other class' condition to fuel the Cutlass. Guys I found interesting tweak. If you steal hero card from your opponent and play it, then all rogue cards give you +1 durability :>. That's amazing! Tess will re-play all your rogue cards too. Absolutely insane card. I completely underrated this one. It's like a Kingsbane that you can run two of that comes with Lifesteal already. If they don't have removal, this is staying, literally till the end of the game. If it will be 4 mana 4/1 it will be playable, with 2/2 is bad! 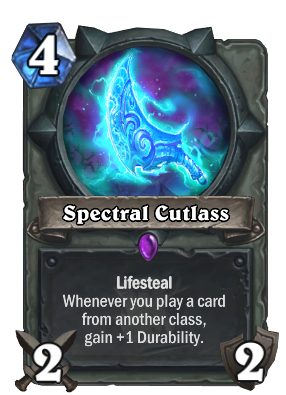 For anyone who think that it’s just a “4-mana 2/2 weapon”, note that it has Lifesteal. You can buff the weapon with Deadly Poison for more healing and also you can buff it’s durability, not so easy though. You can compare it with Kingsbane + Leeching Poison but you need to draw both cards (you can draw weapon with Cavern Shinyfinder but not the spell). With this you don’t need the second card but you need somehow to buff it’s durability. And that’s the problem! Essentially, you need to build the whole deck around this card… well, as for Kingsbane. Even with more steal synergy, 2 attack just isn't worth investing into. Especially on a class that has a subpar weapon at its disposal all game already. Put this in PRIEST on the other hand!